I’ve hunted with licensed and insured outfitters in Canada and in other states, but never in Michigan. Then I recently heard of East Lake Outfitters (WildGameDynasty.com) based in Michigan and I contacted owner Gary Morgan to discuss his operation and find out what is offered. It is a relatively new venture that began in 2011 and is named after East Lake in the Upper Peninsula, where Gary has his bear camp that is located less than an hour drive north of the “Big Mac” Bridge. The regularly baited sites are located in Mackinaw and Chippewa Counties (Newberry Bear Management Unit) and they are selected with big (older) black bears in mind. Most feature ground blinds, but some locations may require a ladder-stand, and trail-cams are used to determine key time frames when the baits are being hit. I’ve been building up my points for a Michigan Black Bear License, and with seven now, I believe I might be in the running for a hunt this fall, and can’t wait to hear the DNR’s results when they come out at the end of June. With this positive thought in mind, I knew it would be best to start making arrangements with a notable business into regularly baited bear sites (doing the baiting yourself before the hunt can be a bit costly with the price of gas, not to mention time consuming). My goal is to use my (Mag-Na-Port Customized) Freedom Arms .454 Casull revolver to bag a Michigan black bear, one of those “bucket-list” matters and with all this in mind I contacted East Lake Outfitters. During my emails with Gary Morgan, I would discover that he also offers deer hunting in the East Lake area, as well as he provides one on one guided spring turkey hunts in Montmorency County near Atlanta. 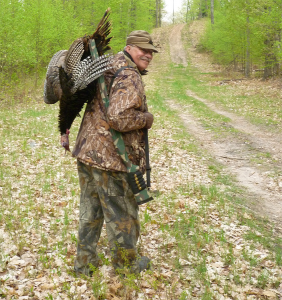 Being quite satisfied with hunting local Thumb birds, it has been awhile since I’ve spring turkey hunted in northern Michigan and I must admit I’ve missed it a bit, so I was quite excited to join Gary on a 3-day hunt recently. The hunt involved both private and public land in the typical wooded and rolling topography found near Atlanta. We often called from ground blinds but also did some roving for birds. I’ve been an avid turkey hunter for more than 40 years and one thing I know for sure is that it is a continual learning experience. I let Gary do all the calling and I’ve found it is best to keep quiet and watch and listen to professional guides per any outdoor pastime in order to learn from them. Gary is real good at “turkey talk” and he had glued turkey feathers to the backs of his decoys in order to provide a 3-D effect. Combine all of this with his knowledge of the area and its birds, I was quite confident the pieces would all come together, but then hunting is hunting and with no guarantees. My turkey shotgun is a camouflage-painted Remington Spartan over/under 12 ga that is choked full and full. During preseason patterning practice (which is critical per turkey hunting), both barrels performed a beautiful duet with Fiocchi “Golden Pheasant” 3 inch magnum, nickel plated number sixes, so that is the only ammo I carried with me. I appreciate the fact the over/under offers two quick shots and is easy to load and unload in the field, and the tang safety is real handy if I have to “switch hit” (from right hand to left hand) if a gobbler suddenly comes in at an awkward angle (and I do practice this to be fluent enough). Although there were plenty of turkeys around, the weather had suddenly warmed, the bugs (black flies, mosquitoes and even ticks) came out in abundance (I believe in a full head-net big enough to droop over both shoulders) and the gobblers didn’t seem interested in approaching our decoys. That is when Gary mentioned a favorite spot of his that featured what he called “Mountaintop Gobblers”. We did an afternoon scout of the spot when the turkeys were gone, and by the time we got to the top of that steep, tall terrain, I dubbed it “Heartbreak Hill”, because I’m getting a bit long in the tooth and with a bit of “mileage”. It was a dandy spot, and Gary had a rake along to sweep out our sitting spots we sought out and located near the base of the very steep hill. We went back later at dusk to “roost” the birds that had gone up into trees for the night. They responded readily to an owl hoot, and we knew things possibly could work out in the morning. That is when we saw the stranger step out of the darkening brush. He was walking his dog and had obviously been out picking morels, but by his garb it was clear to see he was a turkey hunter, and besides looking for mushrooms, he was also listening to turkeys sounding off from the roost. This was public ground and open to anyone whether it was for morels or wild turkeys. When it comes to turkey hunting, it always pays to have a plan A, B and C to fall back on in the event matters become askew at a selected site, and it never hurts to be sociable with strangers listening to the same (public land) gobblers in the roost that you have just put to bed for night. To make a long story short, being friendly and courteous to a total stranger turned out to be quite a fortuitous occasion I will never forget. John Jones lived not far away and had been planning on taking his sister turkey hunting but she had canceled and he really wanted to call in some wild turkeys, especially the ones we all had just been listening to, and he wished to join us at this location the following morning. That worked for Gary and I because we thought we might have to go to plan B, when we really liked plan A. It turns out John Jones is a genuine “Pied Piper” on a slate call. The following morning he was set up 40 yards to my right and back a bit and Gary Morgan had set out his decoys just behind both of us on a slight rise. The mountaintop gobblers loved John’s sweet talking, and came out of their roosts right at daybreak and began their way down the hill with a whole bunch of “gobbling” talk that thrilled me clean to the bone. It all was then up to me, the “designated hitter” in this ballgame, to pull it off. Five gobblers hung up as a group as a real hen turkey off to left tried to pull them away from the “hussies” down below. That is when I heard John make scratching noises in the leaves with his hand, and this pulled one of the birds down, and the puffed-up turkey passed the tree I had previously marked as my 30 yard kill point and I went into the “lock-on” mode with my shotgun, which required an ever slight motion that the bird picked right up on. He went from the puffed-up mode to head straight up and making the alarm “putt-putt-putt” call, which was his final mistake. His bright red head was resting right on top of my green fiber-optic front bead when I touched the trigger, and the shot drove him breast down on the ground for the final count. Yes, he was only a 4 inch “Jake”, but he was the bird in the hand on “Heart Break Hill” and a moment shared with friends that I in no way was about to turn down. I was plenty happy and no doubt so were Gary Morgan and John Jones. They had devotedly and very professionally done their parts, and thankfully, I had followed through with mine. We all got better acquainted a bit more after the hunt. 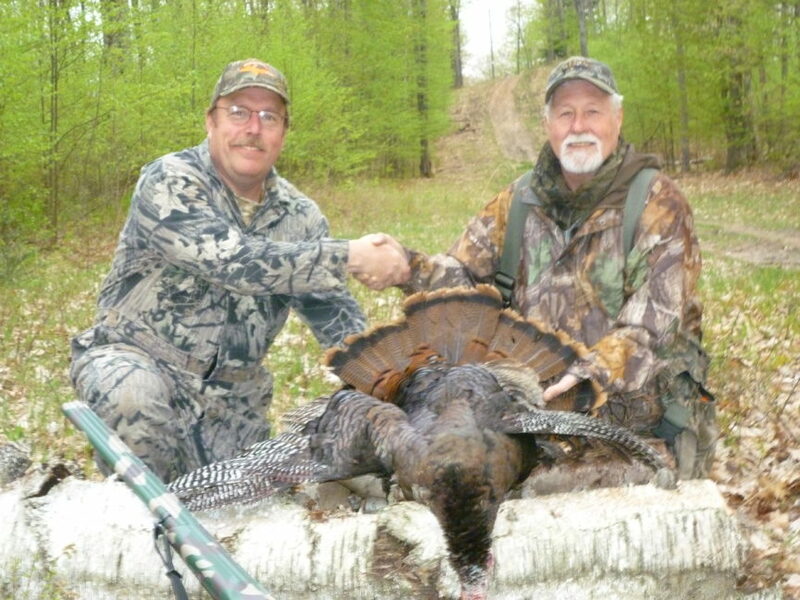 It turns out John Jones of Atlanta is also an outfitter who guides professionally for elk, bear and of course spring turkeys in Montmorency County (Superior Game Services LLC – [email protected]). Go figure folks, I ended up with two outfitter/guides who didn’t know each other and graciously pulling things together on this hunt. I’m sure glad I didn’t miss the shot! Presently I’m hoping to draw a Newberry Unit bear tag and hunt with Gary Morgan of East Lake Outfitters. Should I also succeed against all odds and draw a Michigan Elk tag (that I apply for each May along with for bear), I definitely will be contacting John Jones. My recent wild turkey hunt proved way more successful than just bagging a bird. Meeting new friends and sharing the field with them was both a distinct honor and real pleasure.